Can Mass Production of Components Slash the Cost of Offshore Wind Turbine Foundations? 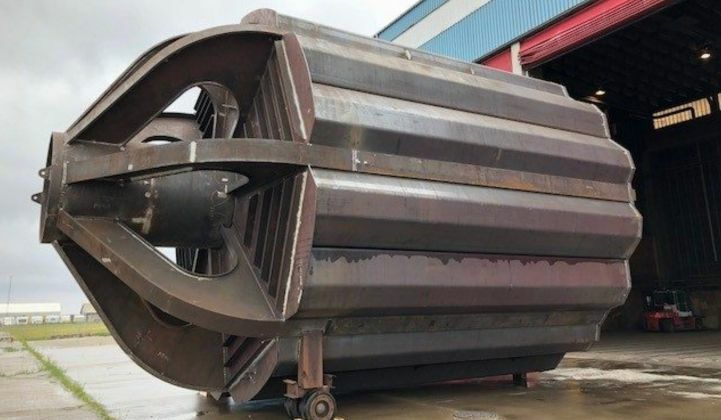 Siemens Gamesa and its Danish partners are working to commercialize a new suction bucket foundation that can be mass-produced and assembled with bolts at port. By the end of this year, Siemens Gamesa and its research partners in Denmark plan to install at sea a prototype suction bucket foundation that could reduce the cost to construct and install offshore wind turbine foundations by 40 percent compared to existing technology. The gravity-based suction bucket foundation, also known as a caisson, is sunk into mud at the seafloor in shallow waters up to about 30 meters deep. Unlike steel monopile foundations, which can disrupt whales and other marine life when hammered into the seafloor, the installation of suction bucket foundations is almost noise-free. In the first phase of the project, the consortium, which also includes Aalborg University, Universal Foundation A/S, and Fred. Olsen Windcarrier A/S, assembled a full-scale 8x8-meter prototype at a facility in Frederikshavn, Denmark. The consortium was awarded a €3.8 million (USD $4.4 million) grant from Denmark’s Energy Technology Development and Demonstration Program for a second phase, during which the prototype will be installed in different soil conditions at a test site off the coast of Denmark. Project researchers say they can build the new suction bucket foundations at a lower cost than existing foundations partially because they will be using much less steel. Existing suction bucket foundations are constructed of steel plates that are 30 to 40 millimeters thick. The project team says it can reduce the steel plate thickness in their foundation to 16 to 20 mm. According to a joint press release, Siemens Gamesa and the Danish steel components manufacturer Ib Andresen Industri originally developed the steel fabrication process for use in onshore turbine towers. The project is emblematic of recent activity in the offshore wind space to streamline both the construction and installation of turbine components. Greentech Media has reported in recent months on research into “industrializing” offshore wind project development and the potential use of 3D printing to erect concrete offshore turbine towers. In this case, the researchers contend that mass production of foundation components, as called for in their design, should save time and money. Existing steel suction bucket foundations are welded at the shipyard into finished units. The prototype foundation developed for this project comprises prefabricated steel modules that can be mass-produced, stacked and then shipped to the staging port. Final assembly of the modules would be done with bolts at port. “We have made the suction bucket in modules to make construction and installation easier. 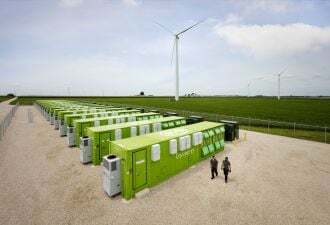 That will lead to more producers of the metal pieces,” wrote Finn Daugaard Madsen, project manager at Siemens Gamesa, in an email. “And we are not limited by space. We could mount it close to a harbor; therefore, the concept allows us to make as many workstations as needed," he added. “We have made calculations that show that the very special profile on the individual steel sheet ensures an extremely strong construction even with the use of significantly less steel,” Lars Bo Ibsen, professor in the Department of Civil Engineering, Aalborg University, told Energy Supply. Finn Daugaard Madsen said the project teams hopes to install and begin testing the prototype by the end of this year. The testing phase extends through April 2019.